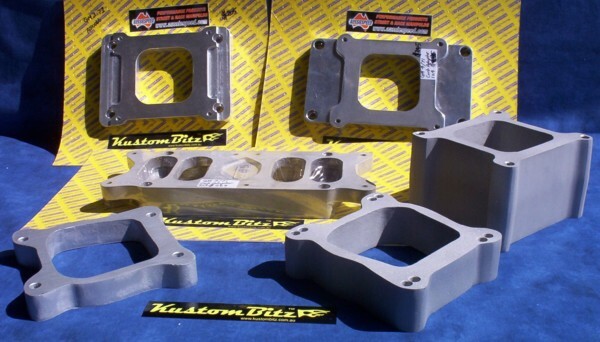 AussieSpeed carburetor spacers are made from sand cast aluminum, or some are cut from billet aluminum plate, they are not like all the other after market die-cast spacers which cannot be welded or modified easily. Sand cast aluminum and aluminum plate is more expensive materials to manufacture these spacers from however the advantages are that they can be easily welded, so you can cut them, drill them, tap them, weld fittings to them, add to them to modify flow, etc. etc. what ever you like. When you are talking performance and trying to dial in your carb and manifold combo by modifying the spacer then these AussieSpeed spacers allow you to do that. Available from 1 inch to 4 inches tall, square bore and spreadbore. We also have carby spacers to suit GM blowers. KustomBitz also has a range of Phenolic spacers for 4 barrel and 2 barrel Holley carbs. Our AussieSpeed Inlet manifold insulator spacers for straight sixes prevent as much heat as possible from transfering from the head up into the intake manifold runners which allows for a much denser air fuel charge resulting in more power and consistent power delivery from your hottie six cylinder engine.